At 21-9, the Nuggets matched the 1976-77 squad for the best start through 30 games in franchise history. They also remain on top of the Western Conference by percentage points over Golden State. This is rarefied air for the Nuggets: The last time they had played more than 25 games and were alone in first place in the conference was March 1977. The Nuggets held each opponent under 100 points in their last six wins at the Pepsi Center. But this one turned into a track meet - a throwback to the days of old for Denver. Fueled by a 14-0 run at the end of the third, the Nuggets took a 105-95 lead into the final quarter. Dallas trimmed it to four before Monte Morris hit a 3-pointer to give Denver some separation. The Nuggets remain without Will Barton, Gary Harris and Paul Millsap due to injuries. Juancho Hernangomez started despite being questionable with a strained abdomen. He finished with 12 points, one of seven Denver players to score in double figures. Mavericks: G Dennis Smith Jr. sat out with a sprained right wrist. ... Dallas coach Rick Carlisle and Wesley Matthews received technical fouls for arguing calls. ... G J.J. Barea returned from a sprained ankle and had 10 points. ... F DeAndre Jordan fouled out with 6:29 remaining. He had 11 points and 12 rebounds. Nuggets: Murray picked up a technical in the first quarter for hanging on the rim and coach Michael Malone another in the third when he argued a call on Jokic. "Probably how consistently he makes half-court shots during shootaround," Carlisle cracked. 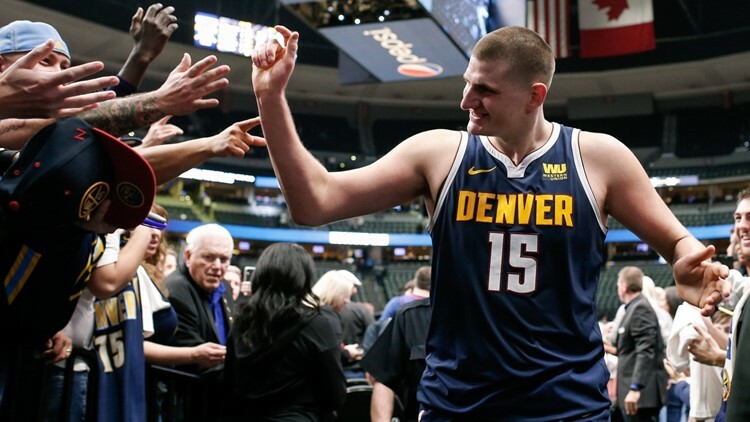 Carlisle said Jokic is an anomaly in the way he can take over the game, but plays "close to the floor." "It's one of the great things about the NBA game: Guys like him that have the size and skill and know how to use leverage and angles, their vision and senses can be All-Star-caliber players. He is that."